Akustus Sereno™ Panels represent the perfect blend between acoustic functionality and design aesthetics. They effectively dampen sound by utilizing millions of microscopic holes in the polyester fibre material that allow for sound to be absorbed and dispersed, creating an enhanced and pleasurable acoustic environment. 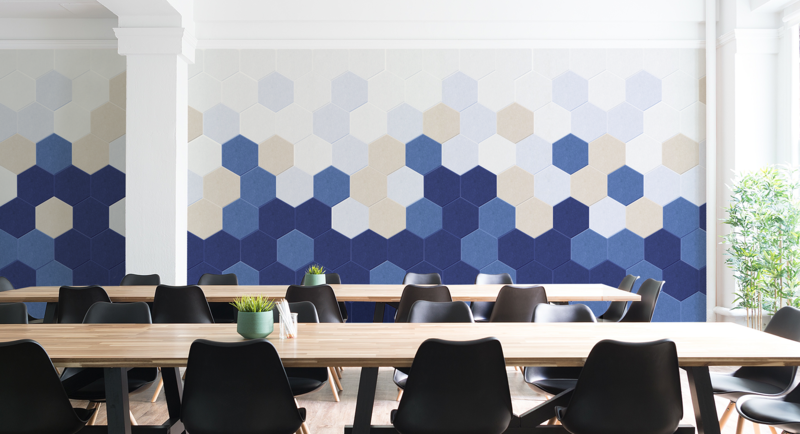 Sereno™ Panel offers an aesthetic appeal that is adaptable to any interior environment while being environmentally sustainable by containing approximately 50% recycled material originating from recycled water bottles. Panels come in a selection of sizes and shapes to suit specific design needs, panels are free of offgassing, fire retardant, and non-toxic.